I'm joining Marty over at A Stroll Through Life for this week's Tabletop Tuesday. Stop by and share your latest table top creation. 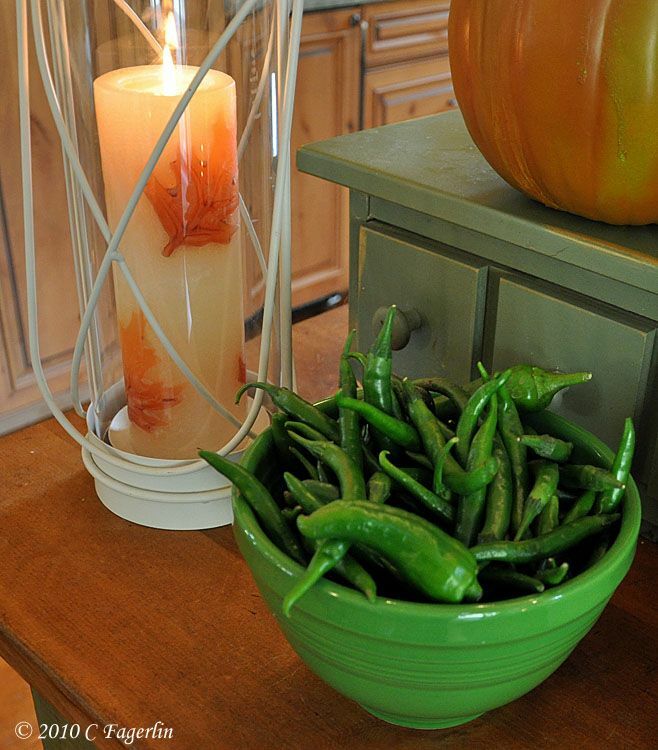 As families gather around tables this Fall, the harvest continues to be bountiful. 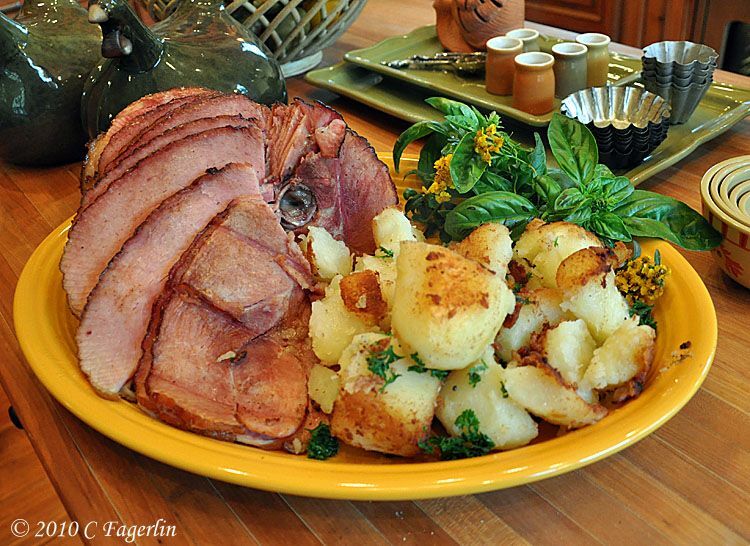 Honey sliced ham and home style parsley potatoes on a Marigold large platter. ANY potatoes boiled - new Reds or fingerlings for a fancier presentation or just as these are done "family style" with Idaho potatoes. Just boil 'til fork tender, drain water, add an appropriate amount of butter to the sauce pan, cover and allow to cool for a few minutes ..... like til you are almost ready to serve. 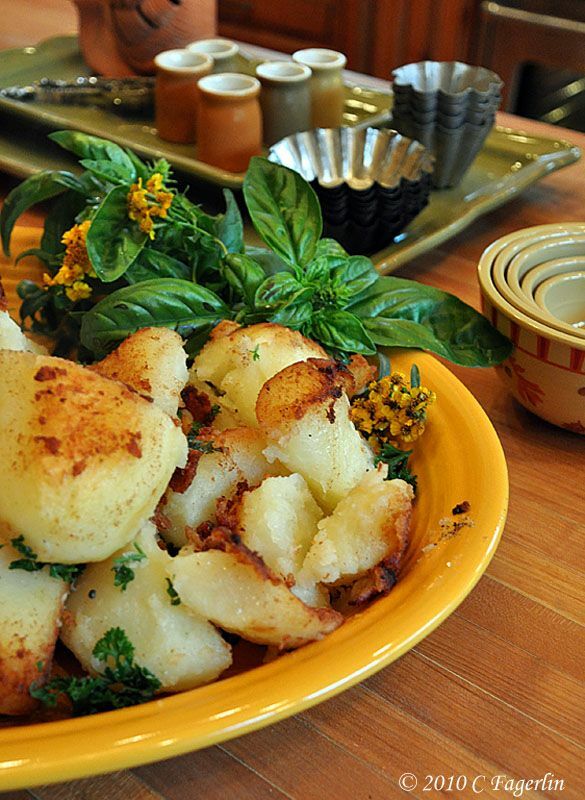 Dump potatoes into a HOT skillet allowing the potatoes to brown, gently turn or toss a couple of times, add chopped parsley at the last minute, toss once more. Serve! ( I also like them with a tiny bit of fresh taragon (that's the yellow flowers on the platter) or fresh basil, but my family only wants parsley. 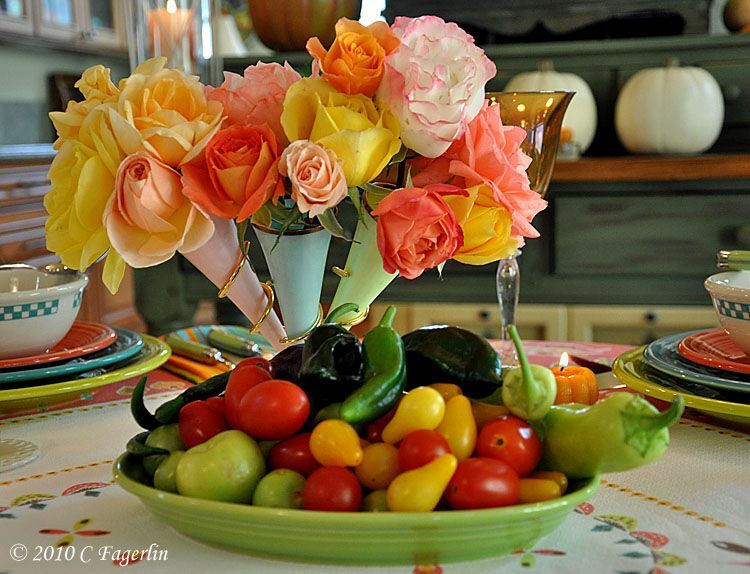 Roses from the garden for the table. Persimmon, with bowls from the Diner line of dinnerware also by Homer Laughlin. on Thursday for another tablescape from The Little Round Table. I re-read my comment and had my fingers on the wrong keys! Gibberish. At any rate, it is suppose to tell you how terrific your table looks. The colors are fall yet are still bright and cheery. 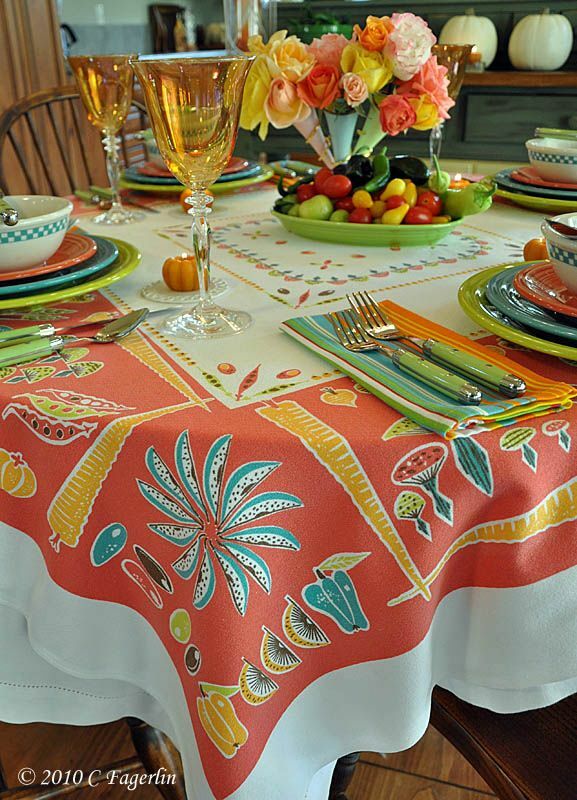 I am always amazed at how you put your beautiful tablecloths with just the perfect napkins and compliments. 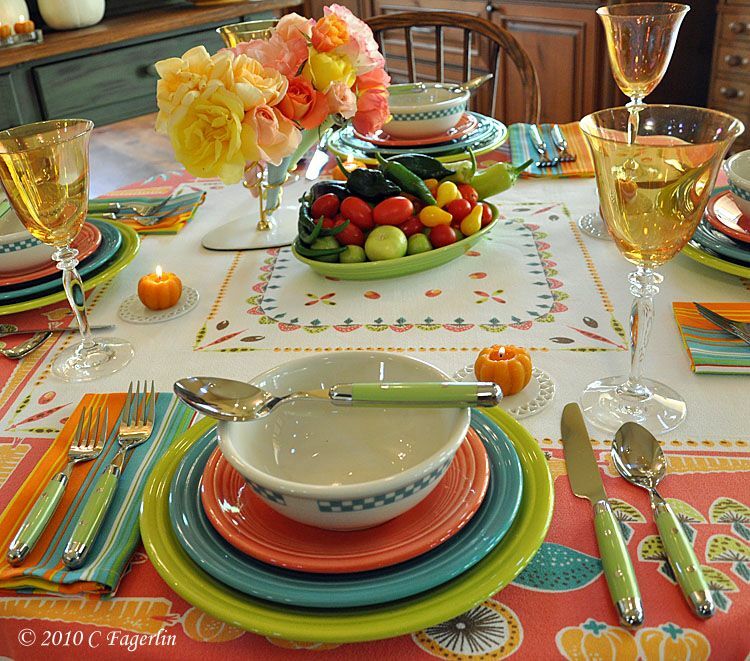 I'm drooling over your beautiful tablescape...love the colors that you used!!! Such bright colors. Your photography is gorgeous. So pretty! 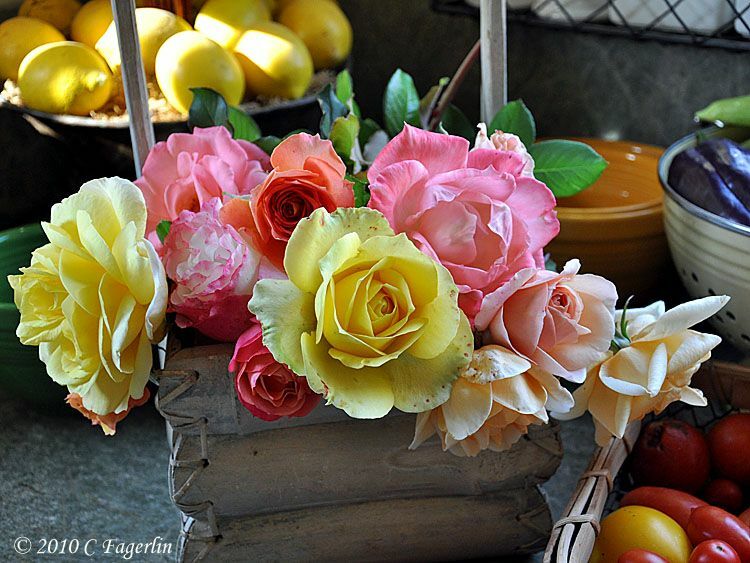 Love the colors in the roses. Another great table setting. I just discovered your blog about 2 weeks ago. It is so impressive. You have really piqued my interest. How do you collect? Do you buy only the plates in different sizes or whole services with all the accompanying pieces when a new color is introduced? Your tablescapes always have the right amount of everything. What about the vintage pieces> I have some from my aunt but was told not to use them because of lead in the glaze. Did you have yours tested for lead? 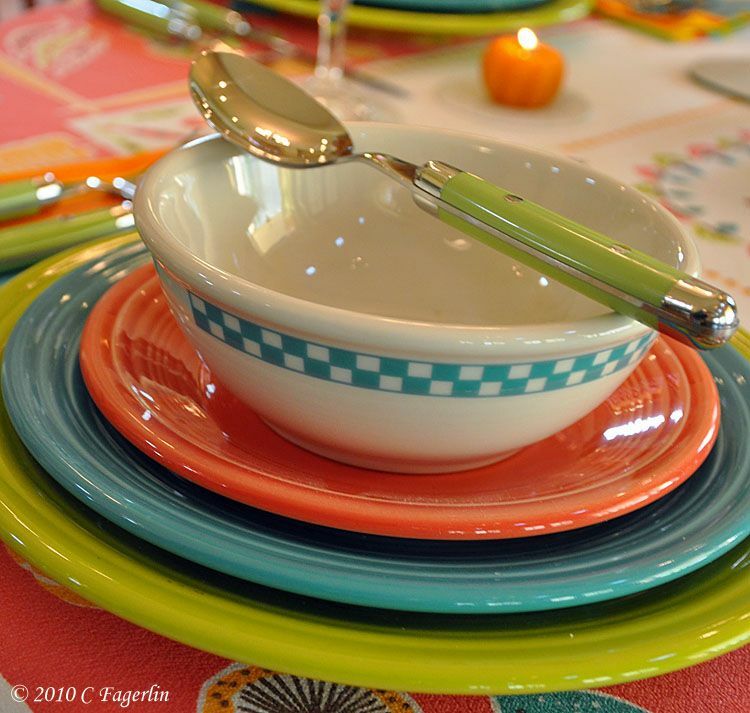 At one time I tried to purchase a place setting of each color as it was introduced, but as time went by I found that the scarlet made me the happiest. It works especially well for Valentine's Day, Memorial Day, 4th of July, and Christmas. 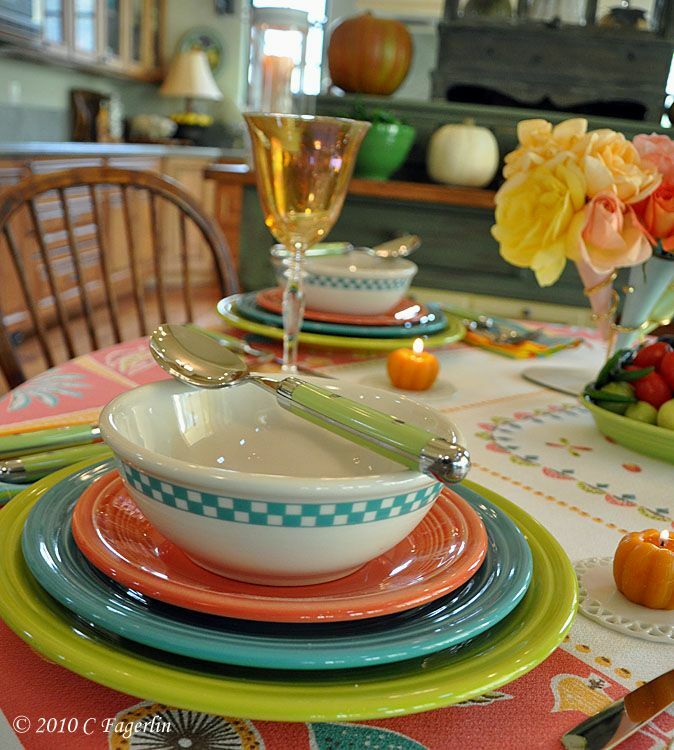 I hope I haven't been too inquisitive, but you seem to have quite a bit of expertise and knowledge to share about Fiesta ware. And you do one other thing that a lot of tablescapers neglect to do. You make sure your tablecloths are ironed and unwrinkled. Just attention to that detail makes such a difference in presentation. Your tables are always so colorful and pretty. The roses look fabulous in the cones. What an incredible bouquet of colors. That dinner of ham and potatoes looked so yummy. 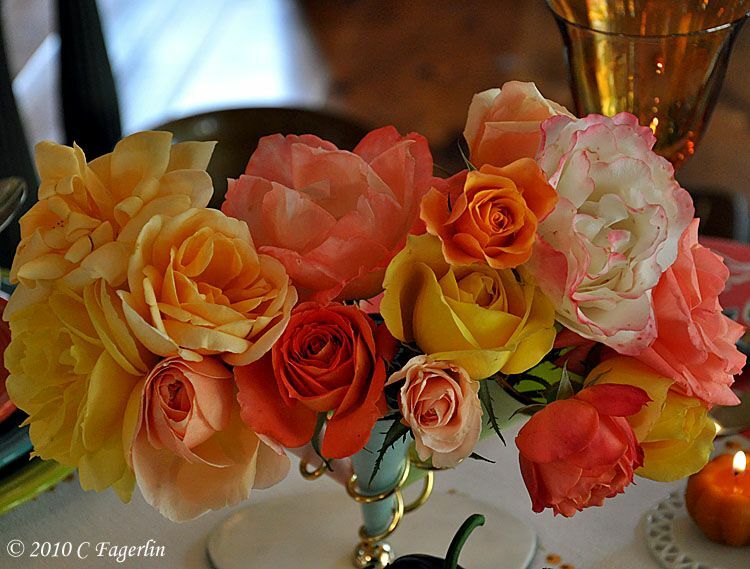 I really like those roses and the layers of colors, and the napkins, and everything! 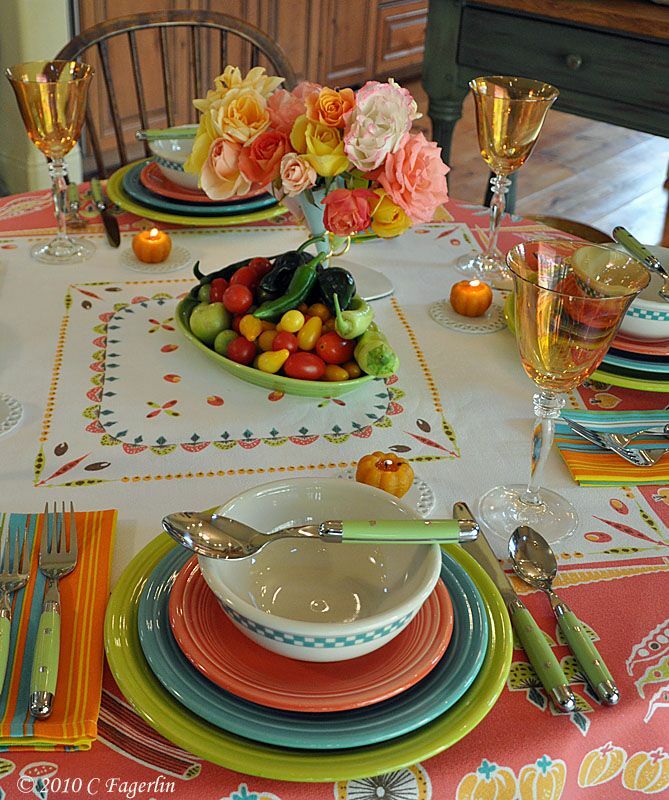 What a colorful and fun vintage inspired table. 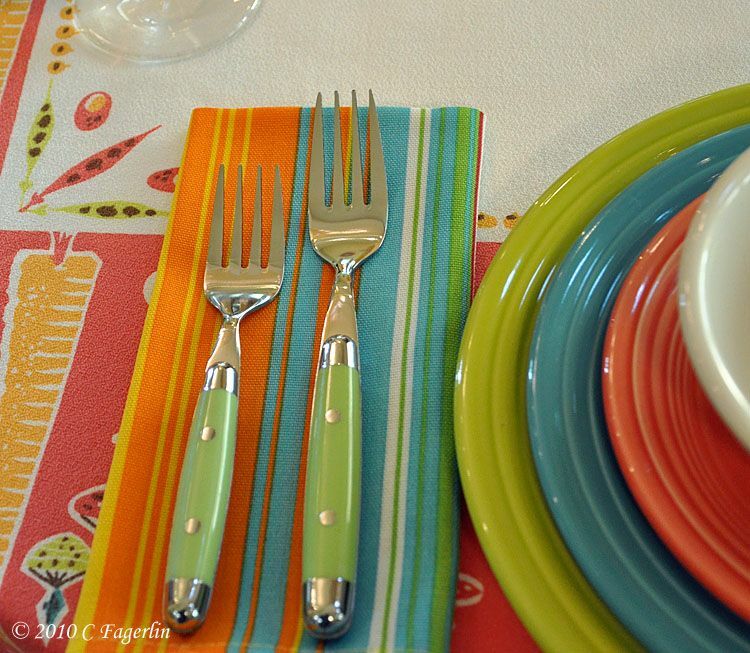 I love all of the color and the flatware is just delightful. The ham and potatoes made me hungry and oh, how lovely the roses still are. Ours are done except for a few pink Simplicity on the hedge, nothing as grand as these. Absolutely beautiful! Love the bowl filled with chili's and peppers. 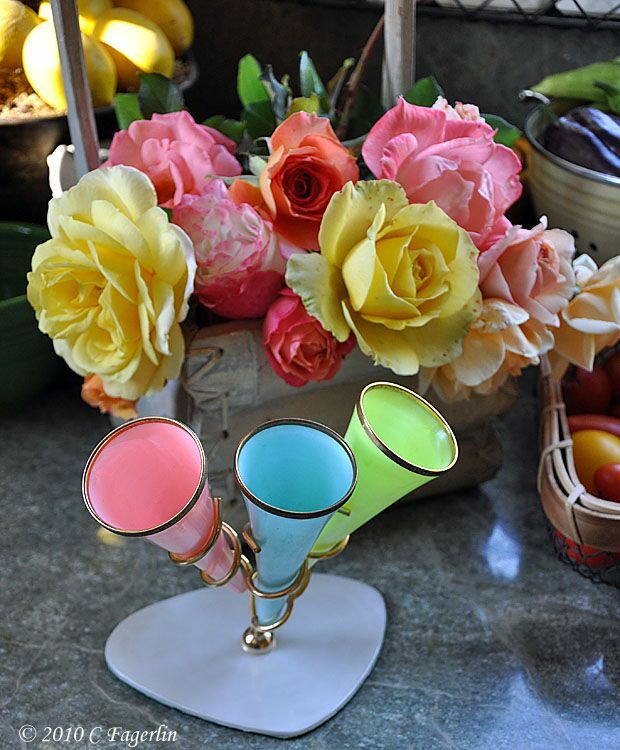 So colorful and goes so well with your dishes! tell us the truth, you planted the roses and tomato plants in your garden exactly matching to the colors of your fiesta dishes, didn't you? That looks great, even the tomatoes match in the color to the dishes. 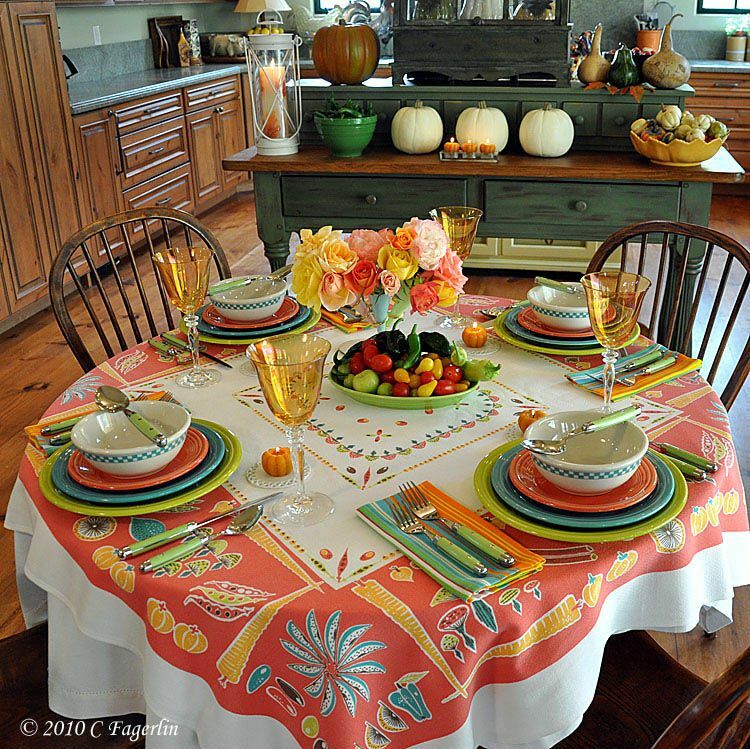 It is a splendor harvest table in those bright colors. Love that. 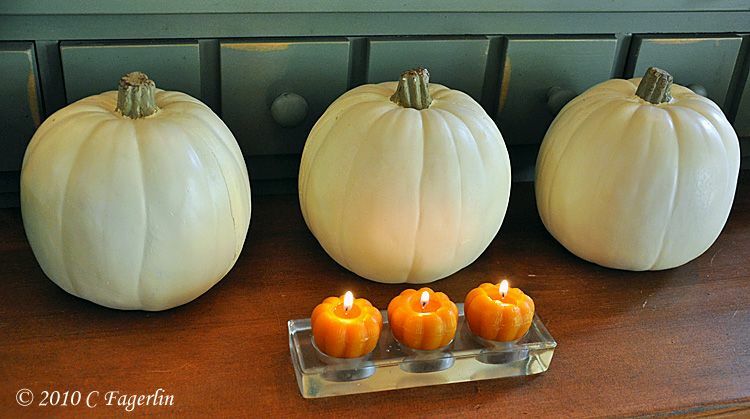 Love the diner bowls and the pumpkin candle "coasters"!! I had admired this cloth in your database, and now it's come to life in ways I could not imagine. 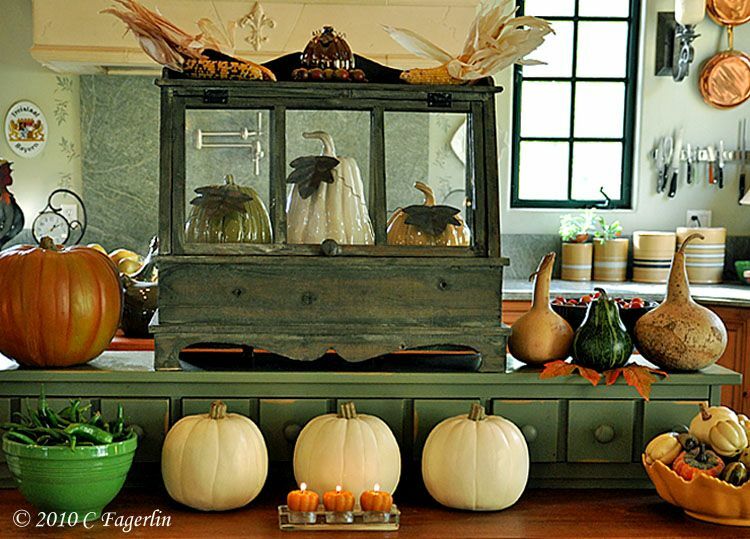 What a great California fall tablescape! Downright spectacularly beautiful. What a gorgeous post. 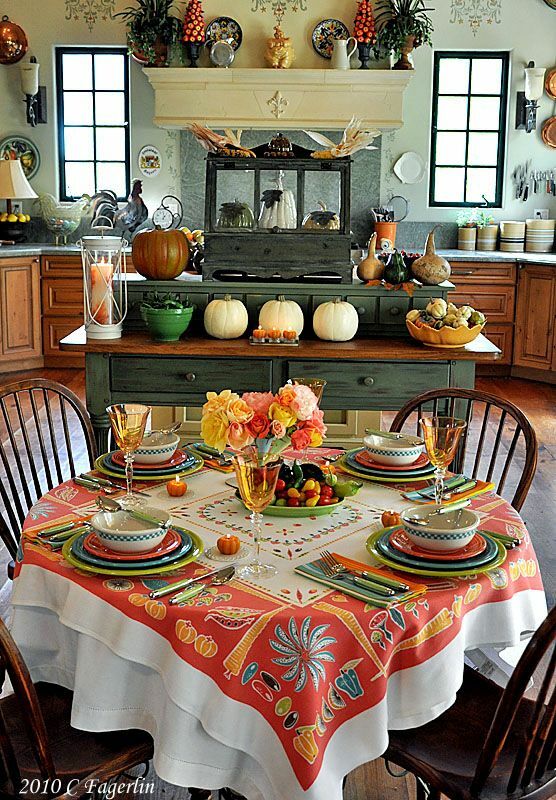 I'm always amazed and taken a back by your lovely decorating and color combinations. Thanks so much for coming by for my Harvest Supper! I appreciate your lovely comments! Q: How do you collect? A: I've began collecting vintage Fiesta in the mid 1980's, but have added very few pieces since around 2001. There were 13 colors produced between 1936 and 1972, but my collection mainly consists of the first six colors: Red, Ivory, Yellow, Turquoise, Light Green, and Cobalt Blue. 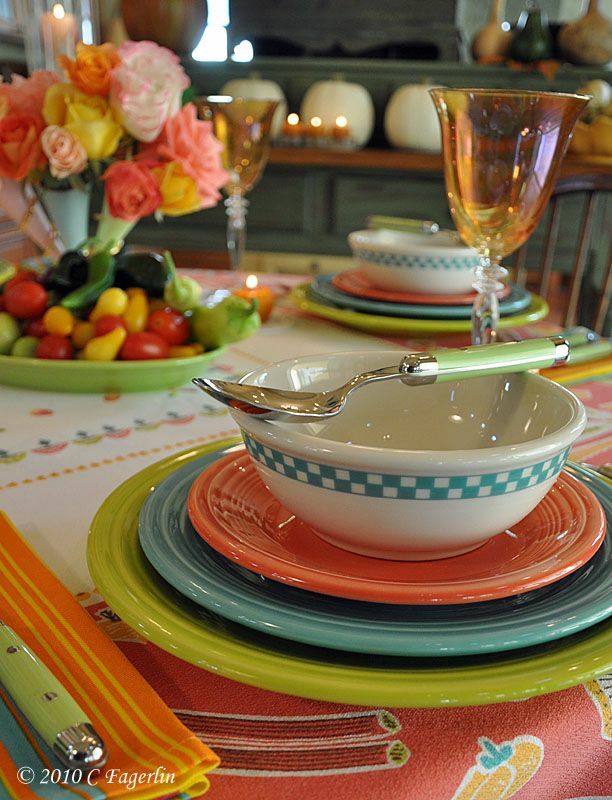 Contemporary or Post 86 or Reissue Fiesta are names attributed to Fiesta dinnerware made since its reintroduction in 1986. There have been 28 different colored glazes produced (some for very limited runs), as well as many decorated / decalled lines on those same colors. I have at least examples of all those colors and some of the decalled pieces. I pretty much buy plates and bowls from open stock and have done so for the last few years. And a couple of special pieces in a new color, but not a whole "set" like I used to with the introduction of a new color. When Fiesta was first reissued, we had no idea it would maintain its appeal for so many years. The "get it while you can" mentality disappeared as the line's popularity increased and it became evident that new colors would continue to appear. Q. "I have some from my aunt but was told not to use them because of lead in the glaze. Did you have yours tested for lead?" A: Most dinnerware produced prior to about the mid 70's (if I remember correctly) contained lead and other heavy metals in the glaze and decorations. NOT just Fiesta! Pretty much any dinnerware made before the FDA began regulating the issue here in the US has issues if you are a purist. Terra Cotta and other decorated and unglazed wares should always be suspect where ever they were made or when. 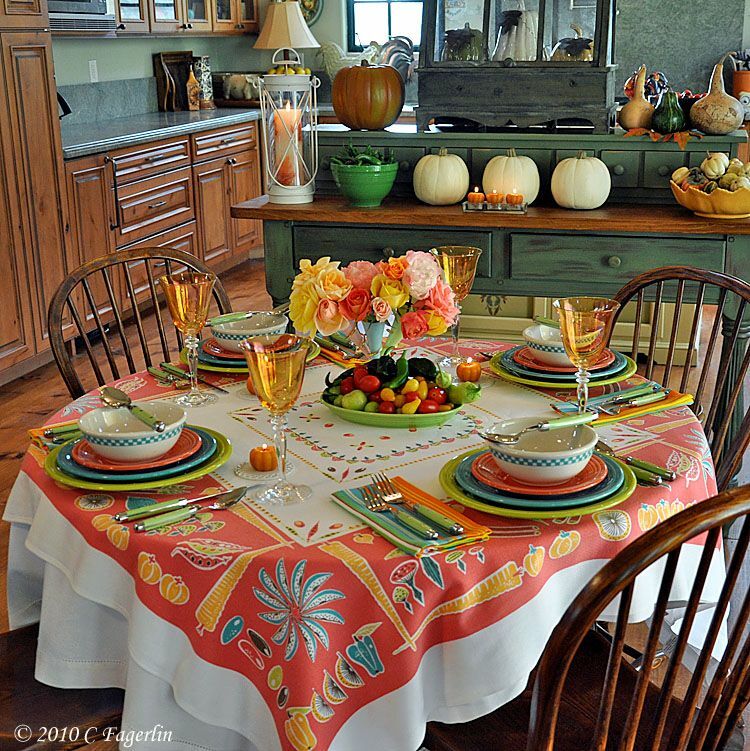 Vintage Fiesta can be used and is used by many people to this day. Some care should be used with acidic foods and food should NOT be stored in/on any dinnerware that is not certified lead-free. Post 86 Fiesta is LEAD FREE! And it is made right here in the USA by the same company that has been in business since the late 1800's. Johanna said, "tell us the truth, you planted the roses and tomato plants in your garden exactly matching to the colors of your fiesta dishes, didn't you?" LOL Johanna! Well I pretty much love color both inside and outside the house! 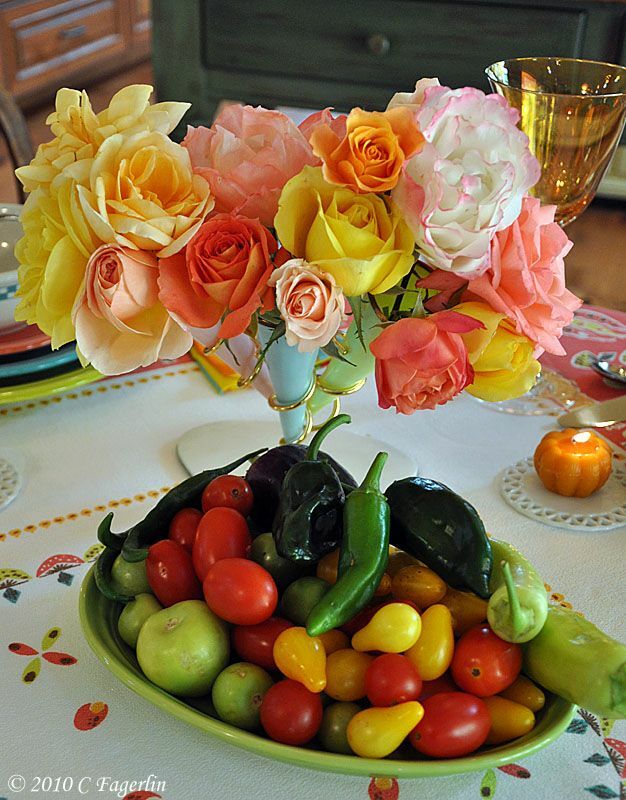 And with a total of about 41 colors of Fiesta produced over the last 74 years, I think any rose or vegetable that I plant will coordinate with my dishes! 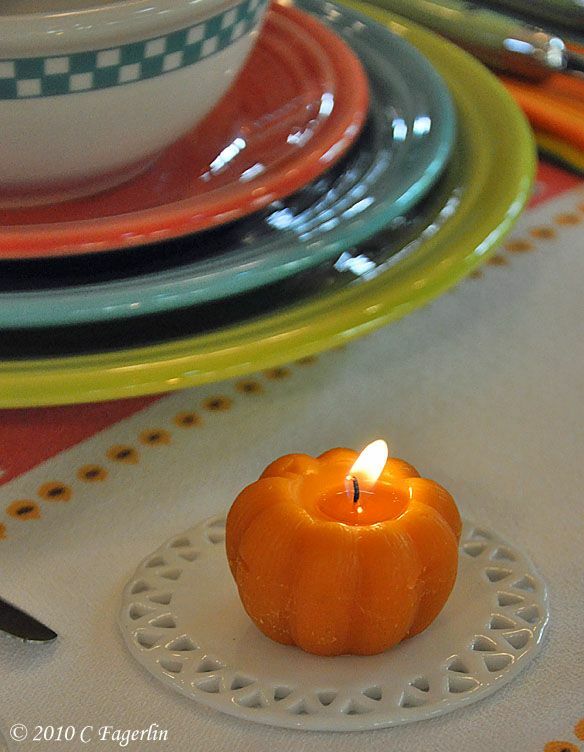 Deb said, "Love the diner bowls and the pumpkin candle "coasters"!!" Those coasters are too cute aren't they??? 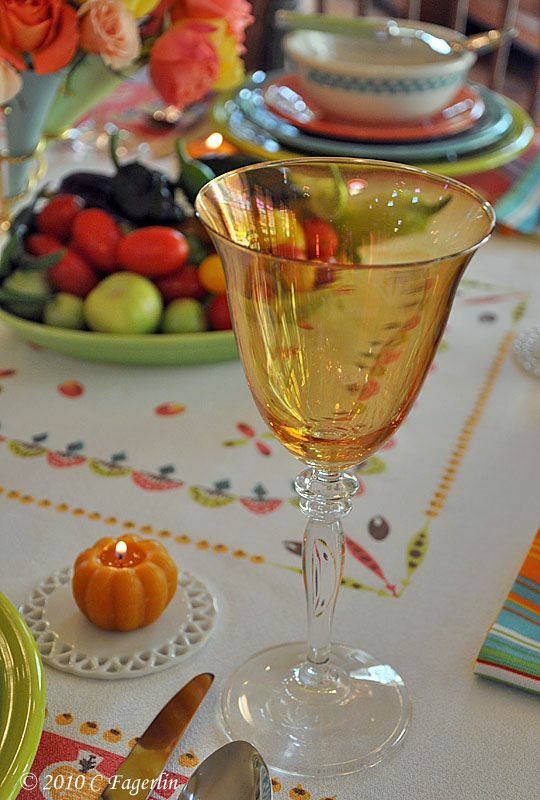 Pretty much ANY stain can be removed from tablecloths with the help of Oxyclean ..... the one exception is candle wax! As my friend Daphne (Hi Ms D!!) says, "Candle was is evil." So these coasters come in handy when I don't want to use a votive or candle holder. And I NEVER blow out candles or move the holder with a candle burning. Always use a candle snuffer! Your tablecloths will thank you and watch out for those RED candles ..... they are the worst! Thanks again for stopping by, I do love talking dishes and tablecloths! I almost lost my whole response in a Blogger hiccup..... so didn't have a chance to fully proof my response ... regarding the coasters, my response should read, "candle WAX is evil." I LOVE IT!!! The colors are beautiful and instantly put the viewer in a happy mood! Lemongrass and Persimmon are two of my favorites. I would love to know how you prepared the potatoes! Beautiful as always! Your roses are gorgeous too! Everytime I'm out antiquing and find fiesta ware, I think of you! Susan - Easy-peasy on the potatoes!